Kitchen and Nook are brightened with Decor and Colour! Adding Home Decor items too brighten and warm the Family Room! Send photos of the room or rooms you would like to decorate, along with your budget... I will work up colour renderings for your NEW LOOK... I will do product research including paint samples, furnishes, etc based on your budget... photos of these items and where they are available for purchase, colour renderings, amd floor plans will be emailed to you! Reasonable Rates... EMAIL ME for more information. P.S. 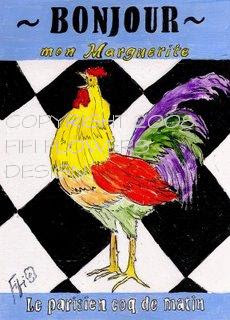 If you desire a custom painting for your NEW ROOM... like this rooster that is perfect for the kitchen above... I can do that too! how creative you are! and i love the painting blog! What an excellent idea. I too love the painting. I get cheered up just coming to visit daily. Just think of living in something you designed. :))How fun. Oh how fun! Isn't the internet great for this? Your falling story was crazy, but thanks for the advice! Sounds like we all have those falling stories - is it a woman thing?! Can't wait for delivery of the painting that you have done for me! I know I will be pleased. I just heard there was an earthquake in your area. I hope everyone is safe and that you did not have any damage. And yes, this blog world is a wonderful world of opportunity and cameraderie! Yay for you, Fifi! Bonjour, Fifi! Comment allez vous aujourd'hui, apres l'Earthquake? Bien, j'espere! Not sure how to say "Keep up the great blogging" en francais! Bring on the commissions... I would love to paint for everyone... a Fifi Flowers original in every house around the world!